Our 22 acre campus is one of the greenest in the city. This has been possible only due to the impressive number of environmental sustainability initiatives at Omega, which are constantly supported and cared for by enthusiastic students. Over 300 trees of 150 different native species have been planted by students around the campus, over the last three years. Students, supervised by experts, have developed two butterfly gardens in the front yard of the KG block. Omega school has been awarded the Adyar Link Canal Restoration Project. Omega school students and staff maintain and develop the 500m length of river link canal, adjacent to the school, into a sustainable ecosystem. 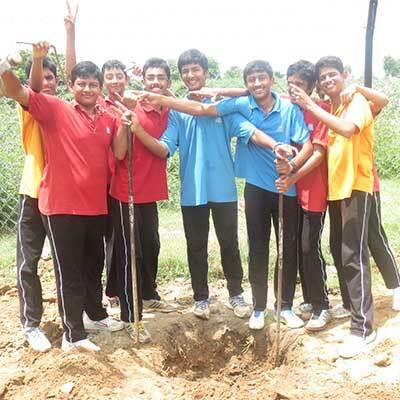 Omega school has undertaken plantation of indigenous trees, shrubs and reeds along the side of the canal. Efforts are made to attract wetland birds, fish and animals to the ecosystem through specific measures. We are a litter – free campus. We avoid using plastics to a large extent; all snacks served are freshly prepared thus reducing the usage of plastic wrappers. We segregate waste into Biodegradable, Non-Biodegradable and Health waste. All biodegradable waste is processed and used within the campus. Students learn pot composting to produce organic manure from kitchen waste. This initiative will be taken by Omega students to their household shortly. We have built an industrial model for Vermicomposting with kitchen waste, and leaf litter from the campus. Underground water is treated for consumption using four RO plants of total capacity of 4500 litres/hour. All the waste water in our campus is treated. 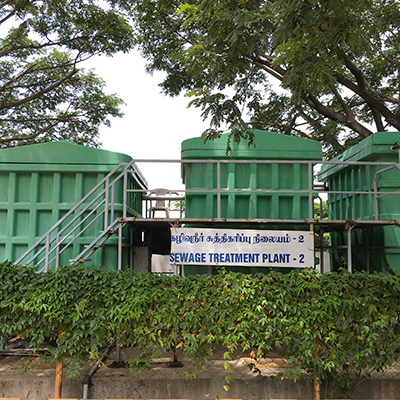 We have installed four modern STP plants for treatment of hostel waste water and an ETP plant for treating laundry effluent. Each STP plant can handle 130,000 litres/day and the ETP 10,000 litres/day. The discharge water from both the STP & ETP plants and the RO discharge water are used in the gardens within the campus. The sludge from the STP and ETP plants is used as fertiliser in the campus gardens. We have two ponds on campus, to harvest around 3 million litres of rainwater, which help in restoration of ground water levels for the entire village. The school thus has a very healthy water table at less than 15ft. 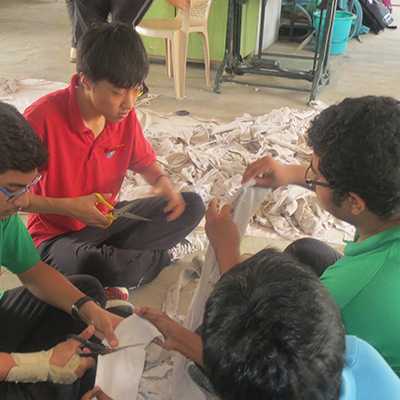 Our students recycle waste paper and cloth in the Omega Paper Plant, to make handmade paper. The paper production also makes use of leaves and herbs collected from the campus. 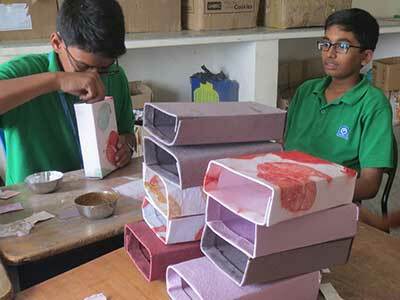 Students make useful and aesthetic stationery products from the recycled paper. The styled paper products are used in our offices and are also available for sale. A pilot Biogas plant processes 50 kg of food waste and produces Biogas cooking fuel for use in the kitchen. 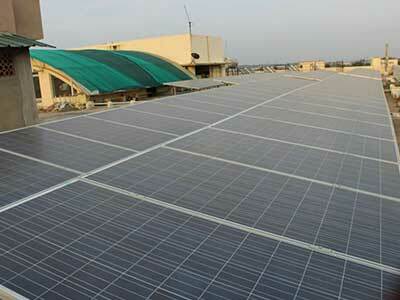 200 KW of Solar panels have been installed on our rooftops for production of electricity to augment grid supply. Another 40 KW will be installed shortly. Another 5000w of solar power, through stand alone panels and using homemade LED lamps on posts, is used for avenue, corridor and periphery lighting. 2500 litres of water heated by solar water heaters provides hot water for the hostels. An industrial-grade steam Laundry caters to needs of the resident students and staff. The waste water is treated in the ETP installed for the purpose. A bakery with a medium scale oven produces bread and other baked goodies for the school students and staff. 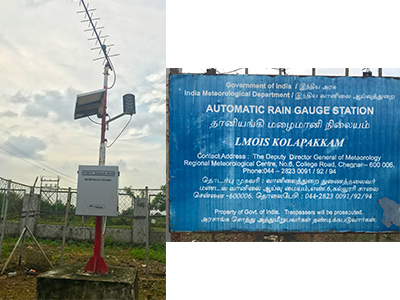 A 50 foot automatic rain gauge (ARG) station which runs on solar power has been installed in the school campus, by the Indian Meteorological Department in Chennai, to provide location-specific weather data such as humidity, rainfall and temperature. This is one of the official weather monitoring stations of the Department in Chennai. Nature camp: Students of Class X are taken every year on a Nature camp in the midst of a forest in India, to study the Ecology of the region and understand the significance of forest conservation. Past batches have undertaken a trip to the forests of the Western Ghats and to Jim Corbett National Park. Students participate in a Turtle walk along the ECR coast, to understand the significance of Olive Ridley Turtle conservation. Students visit the Nanmangalam forest, to study the shrub forest ecosystem and have been to the Pallikarnai Marsh and to Vedanthangal, for study of swamp ecosystems, local migratory and other birds, and their habitats. Tree walks are conducted for students to get familiar with the trees in our campus and in the neighbourhood. 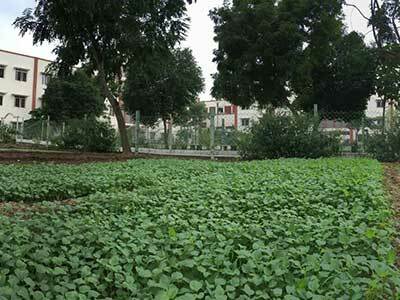 Within the school campus, we have an acre of organic gardens that are used to grow vegetables. The harvest is used in the school kitchens, which make nutritious meals for children. Primary students are regularly taken on educational campus walks to the organic garden.